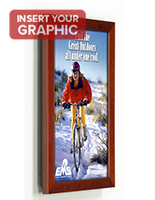 These wood poster frames are among the highest quality wall displays available. 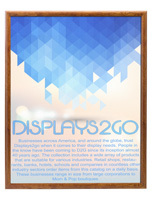 These image displays are ideal in the most upscale environments. 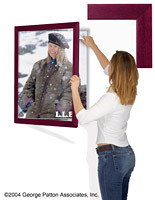 Some of the most popular applications for these wood frames are bank & hotel lobbies, upscale retail stores and business offices. 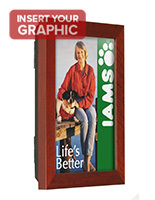 These wall displays, message holders and wood poster frames feature a swing open front door panel for quick image changes. 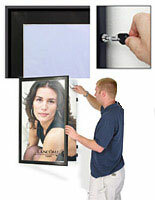 Your image is held in place by re-usable sticky tabs and the door latches shut utilizing the gravity lock system (see inset image to the right). 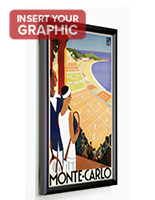 These displays, the 18" x 24" poster frames are constructed from wood and have a cherry finish. 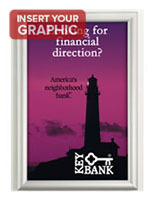 The front lens is clear acrylic giving a clear view of your message. 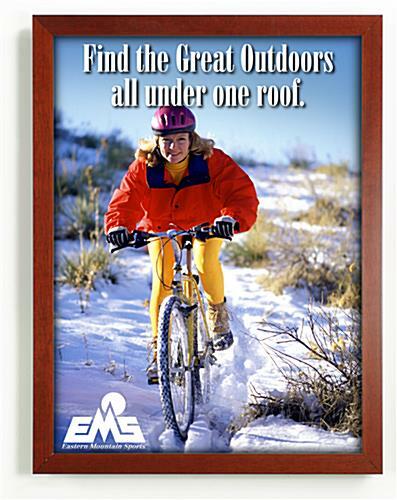 We provide these wood poster frames with mounting screws & anchors and a pre-attached bracket.